In this example, we investigate the soliton self-frequency shift arising from stimulated Raman scattering in a fiber. 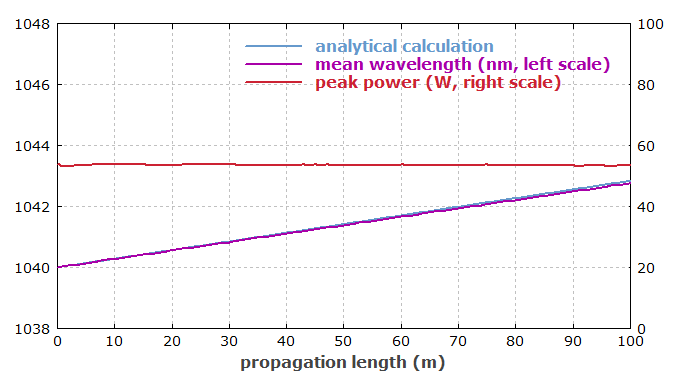 The Raman gain, getting stronger towards longer wavelength, amplifies the longer-wavelength components within the pulse spectrum at the expense of power in the shorter-wavelength parts. In effect, the pulse spectrum more and more drifts towards longer wavelengths. Also, there is a slight decrease of pulse energy and an increase of the pulse duration. It has been assumed that there is no higher-order dispersion. The diagram above compares the numerically simulated evolution of center wavelength with that of a simplified analytical model. They agree well. 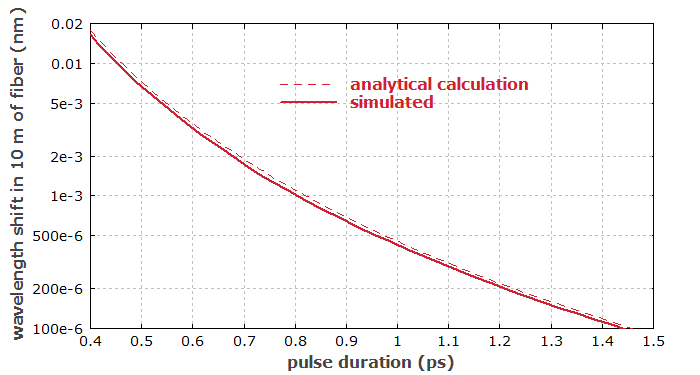 Below you see results of a simulation where the pulse duration is varied. In agreement with the analytical theory, the numerical model shows that the self-frequency shift becomes substantially stronger for shorter pulse durations. This is because shorter pulses have a higher peak power and a broader spectrum, within which the Raman gain (increasing with the frequency offset) can have a stronger effect.